A premiere gated community in Carolina Forest, The Bluffs on the Waterway is a luxury development of custom homes located on the Intracoastal Waterway. Situated on the beach end of Carolina Forest between The Battery on the Waterway and Waterway Palms Plantation, The Bluffs is close to the Food Lion shopping center as well as Forest Crossing, in one of the best and most convenient locations of Carolina Forest. A boat owners dream, the community features a private boat launch and storage. 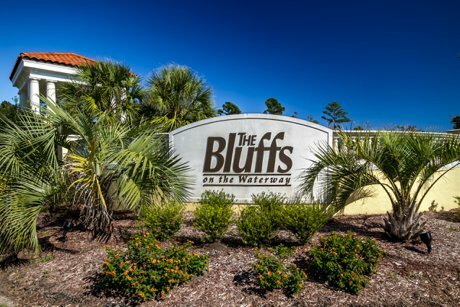 The Bluffs on the Waterway fuses opulence with recreation and natural beauty, boasting a beautifully landscaped entrance and a grand clubhouse which features a swimming pool, children’s play area, and tennis courts. The Bluffs on the Waterway offers beautiful custom build homes, some of which are located directly on the Intracoastal Waterway while others are situated on lakes. Homes range in style from Mediterranean, to Charleston Style, to more traditional. The sizes of homes range from just over 2000 to almost 6000 heated square feet, with three to six bedrooms. Pricing starts around $400,000. With quite a few lots still available you can buy property in The Bluffs now! 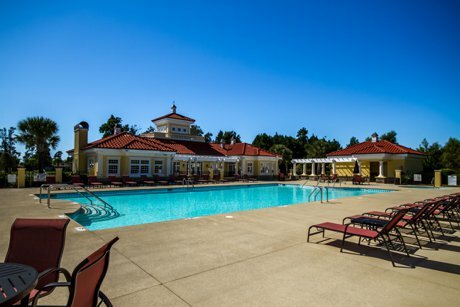 Build your dream home in a neighborhood that is close to the beach, shopping, dining, and all the world class attractions Myrtle Beach has to offer! There is no timeframe to build. Available lots in The Bluffs include Intracoastal Waterway and lake front lots, ranging in price starting around $55,000 and up to over $300,000. For additional information about Myrtle Beach Intracoastal Waterway Homes or The Bluffs on the Waterway homes and lots for sale or selling a home or lot in The Bluffs on the Waterway contact Beach Realty Group today! 843-424-6900 or email us. Listing courtesy of Weichert Realtors SB , Kat Fandel.